Being safe at school is paramount. In the winter, when the heating in schools is often on constantly to create a comfortable working environment for teachers and pupils alike, there is often a risk of injury through burns. Contour are passionate about irradiating that risk. We provide a bespoke range of low surface temperature radiators to schools to ensure a safe but warm environment for all, where the risk of burns is minimised as a result of our excellent safety features. Why Are LST Radiators Important In School? In the UK, government guidelines advise that classroom radiators don’t exceed the temperature of 43 degrees. Contour work to produce LST radiators in line with recommended guidelines to reduce the risk of burns if a child were to fall. Contour’s range of LST radiators are designed with the needs of our customers in mind. Schools are full of pupils whose learning should be impeded by unsafe radiators posing a danger to their well-being while they study. Does An LST Radiator Damage Efficiency? A concern often held around LST radiators is that by preventing surface temperatures from going above 43 degrees, the efficiency of the radiator itself will be compromised. 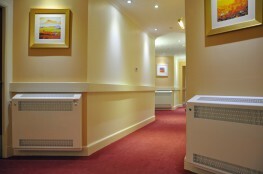 Contour LST radiators are designed with the inclusion of a coating of Kingspan foam on the interior. This foam is specially designed to reflect the heat generated back into the room. Without this coating, that heat would be lost, which then eliminates the possibility of a cost-effective radiator. Additionally, there are environmental benefits to this, as the risk of wasted energy is reduced by the inclusion of Kingspan foam creating warmer, safer schools while also being mindful of the environment as well. By including Kingspan foam into the design of our LST radiators, Contour ensures that classrooms are always comfortable and warm for learners and teachers while protecting the environment, reducing costs for schools and creating an energy efficient environment.